-Contemplating Contemplative Prayer: Is it Really Prayer? -Peter Senge: A New Church Shaman? Mindfulness is a Buddhist concept and practice, the seventh step of the Eightfold Path. Mindfulness is more than a meditative practice; it is an outlook on life and reality that ideally results from a type of meditation designed to cultivate detachment. Detachment in Buddhism is necessary, because Buddhism teaches that attachment to this world, to your thinking, to your identity as an individual self, and other attachments, such as desires, keep you in the cycle of rebirth. Buddhism holds that the self does not exist, and identification with the self keeps you in that cycle of rebirth. Therefore, to achieve liberation from this cycle, one must break the attachment, so detachment is necessary. Mindfulness is the method, and detachment with ultimate liberation is its goal. Mindfulness is often defined as a moment-by-moment nonjudgmental awareness of the present. For many years, this writer attempted to incorporate mindfulness into her life prior to becoming a Christian. 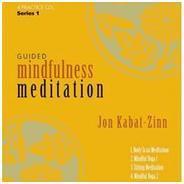 Though thoroughly Buddhist, mindfulness has been heavily promoted to the secular world by Jon Kabat-Zinn (b. 1944), a Zen Buddhist, whose book, Wherever You Go, There You Are, brought him into the public eye; and by Thich Nhat Hanh (b. 1926), a Zen Buddhist from Vietnam whose books have enjoyed great success in the West. Both lecture around the United States. Kabat-Zinn, however, is no secular person. He was a student of Zen Master Seung Sahn and is a founding member of Cambridge Zen Center. Kabat-Zinn started a system now called Mindfulness-Based Stress Reduction at the University of Massachusetts Hospital a few decades ago. Below is an excerpt from an article, Fully Experiencing the present: a practice for everyone, religious or not, October 2, 2010, By Nomi Morris, Special to the Los Angeles Times, at http://articles.latimes.com/2010/oct/02/local/la-me-1002-beliefs-meditation-20101002 (If link is dead, search using title and reporter's name). Excerpt====An emeritus professor of medicine at the University of Massachusetts Medical School, [Jon] Kabat-Zinn developed the system known as Mindfulness-Based Stress Reduction (MBSR) and founded the first MBSR clinic at the university's hospital more than 30 years ago.
. . . Today there are more than 200 medical centers in the United States and abroad that employ the MBSR model to complement conventional therapies. Kabat-Zinn is reluctant to use the word "spiritual" to describe the approach to healthy living that he promotes, characterizing it instead as being "grounded in common sense." . . .
"I don't have to use the word 'spiritual,'" he said. "Part of it is the power of silence and stillness. And part of that power is the power of healing that happens when you move from the domain of doing to being. It's transformative." In fact, there have been rabbis, priests and even an imam who have taken Kabat-Zinn's eight-week MBSR training course and told him that it deepened their experience of their own faiths. Kabat-Zinn states in the article that mindfulness is "grounded in common sense" and is not necessarily spiritual. However, there is no basis for this statement. Mindfulness is based on a specific worldview found in Buddhism, particularly Zen Buddhism. In Buddhism, the mind is a barrier to grasping ultimate reality and truth; therefore, the mind must be bypassed. Mindfulness is designed to do this. The concept of mindfulness has spread into the health care community, as noted in the article. It is usually taught as a form of stress reduction. If one practices mindfulness meditation on a fairly regular basis (not even necessarily every day), that person may eventually adopt the worldview behind it, leading one to believe that the process of detachment is at work. However, since the self is real, there can be no true detachment; therefore, no liberation or true peace results from mindfulness. The techniques of mindfulness meditation lead one to enter an altered state, the same state one is in when under hypnosis. In this state, the meditator's critical thinking and judgment are suspended, and anything can enter the mind. Ironically, since even the mind in Buddhism is not real and one is to achieve no-mind, the term mindfulness becomes an oxymoron. Moreover, the liberation so dearly sought through Buddhism is nirvana, which is not a sort of Buddhist heaven as many think, but is actually the extinction of all illusions, including the illusion of self. Buddhism has no supreme God, no mind, no self. Ultimate reality is sunyata, a term loosely translated as the void, or emptiness. It is not emptiness in the sense of nothingness, but rather the ultimate reality of formlessness from which all has arisen (similar to the Tao in Taoism). The belief is that the world is full of rising and falling, and peace comes with the cessation of rising and falling. But there can be no joy or peace in formlessness, because the self is not there, since there is no self. If you are a Christian, the basis, rationale, and goal of mindfulness is in complete conflict with a Christian worldview and with the reality presented by God in his word. Mindfulness has nothing in common with biblical meditation, which is thoughtful contemplation of God's word. Biblical meditation and prayer are not matters of trying to go beyond thought, either to achieve a mystical oneness with God, or to "hear" from God. Nothing like this is taught anywhere in the Bible. Prayer in the Bible is always presented as verbal praise, petition, confession, and expression of gratitude to God. Furthermore, the concept of needing detachment goes against biblical teaching that we should remember what God has done, and vividly keep before us Christ's atonement on the cross and his bodily resurrection. There are many desires that are good, and desire to know God more deeply through prayer, Bible study, and worship nourishes believers in Christ. There is no need to fear attachment or good desires. Mindfulness and the practice of Christianity do not mesh and cannot co-exist. If you are not a Christian, consider whether or not you wish to attach yourself to a teaching of non-attachment that stems from teachings that reject God, the concept of self, and the concept of an individual mind, while exalting a belief that the ultimate state is one of extinction from all desire, in which you essentially do not exist. This article is not to attack anyone, but to show mindfulness in the light of God's word, the Bible. If you do not know Christ, consider reading about him in the Bible or see the article, "Who Is Jesus" to the right of this article.